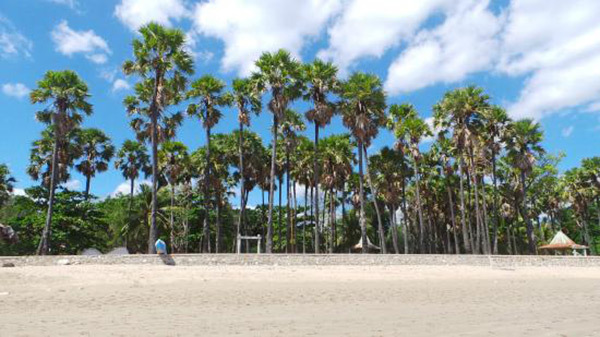 Lasiana beach is located in the district of Central Kupang, Kupang, which is only 12 kilometers from town. The access to this beach is easy and it perfect for family recreation to enjoy white sand and rolling surf. This beach is officially opened since 1970, and it has land area for about 3.5 hectares. The land above the beach is covered with lots of palm trees and palm plants. Both of these plants are often used to make lopo-lopo, as seen lined in Lasiana Beach. At this beach, there are 14 units of Lopo-lopo buildings. Lopo-lopo is the local designation for the cottage shaped like a canopy, poster palm tree trunks or wood and thatched roofed, palm leaves, and reeds. It could also be that the outside of the roof zinc coated fibers, coconut or palm fronds, and reeds. The building serves as a place of shelter and rest for the tourists while enjoying the view of the beach. There are several commercial stalls, souvenir kiosks, a stage for entertainment event, and there is also a swimming pool.